This single hole compact desktop sharpener is perfect for the home or office. Features a helical steel blade, heavy-duty motor with an auto reset device preventing overheating, an auto pencil stop for a perfect tip every time and an easy-to-empty receptacle that stops operation when removed. 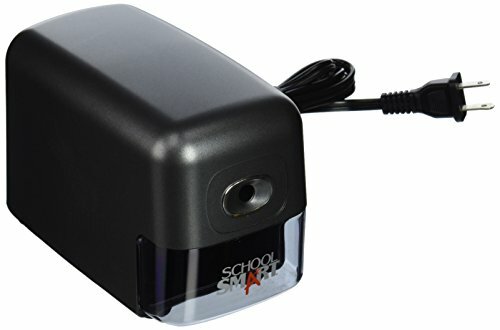 Measures 5 1/2"H x 3 3/4" W x 7 3/4" D Great Value Heavy-Duty Sharpener Perfect For School Or Home Use. Classroom tested low and wide footprint helps prevent tipovers. Auto pencil stop makes perfect tip everytime. Auto reset device prevents overheating. School Smart offers quality teaching and education products at a great price.